1982 was the final year for the “shark” Corvette but the first year for the L82 Cross-Fire 5.7 liter/350 ci V8—a throttle body fuel-injected design that put out a respectable for the day 200 bhp and 285 lb-ft of torque. The downside was that it was only available with a four-speed automatic transmission; a manual transmission would not return until the middle of the 1984 model year. Top speed for the 1982 Corvette was 125 mph, and Road & Track managed a 0-60 time of 7.9 seconds. Estimated fuel economy was 15 city/26 highway by the standards of the day—not bad for a fairly large V8 with primitive engine controls. Standard exterior and mechanical equipment in the $18,290 base Corvette (about $45,100 in today’s dollars) included a Delco Freedom II battery, power steering, power disc brakes, and P225/70R15 tires on 15-inch by 8-inch steel rally wheels. Inside, air conditioning, power windows, tilt-telescopic steering wheel, quartz analog clock, and an AM/FM stereo radio were all included. Optional exterior and mechanical equipment included power sport mirrors ($125), power door locks ($155), cruise control ($165), electric rear window defogger ($129), gymkhana suspension (only $61 for specially tuned shock absorbers, higher-rate rear spring, and a rear stabilizer bar), two-tone paint ($428), aluminum wheels ($458), and P255/60R15 Goodyear Eagle GT tires ($543). Optional interior equipment included a six-way power driver’s seat ($197) and an AM/FM stereo radio with a cassette player ($423). Options that date this car include the stereo radio with cassette and Citizens Band ($755) and the stereo radio with 8-track player ($755). Corvette buyers piled on the options: the average buyer ordered $2,195 worth, raising the sticker to $20,485 (about $50,500 in 2014 dollars). 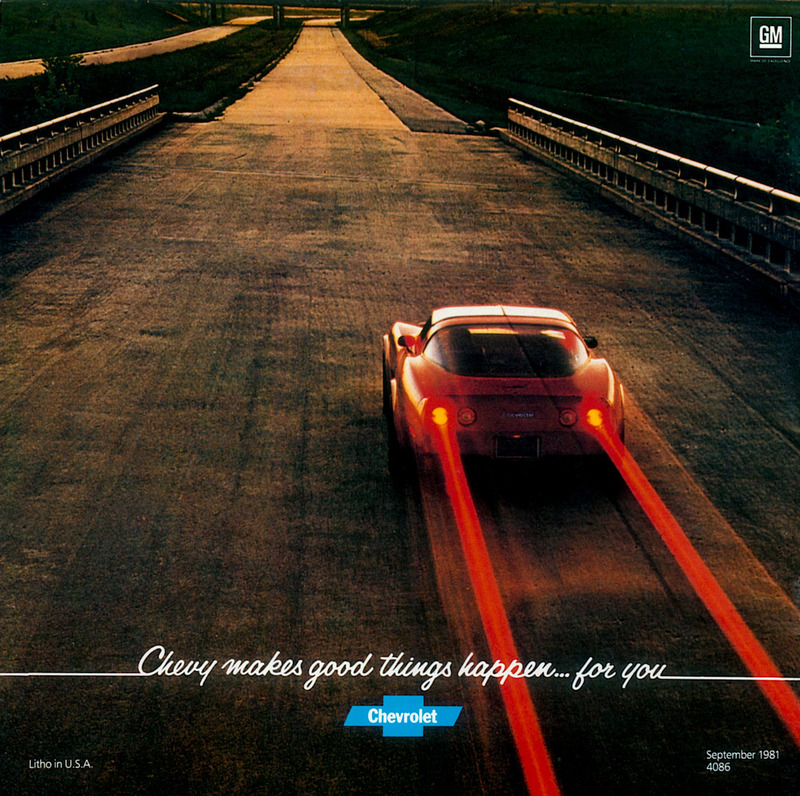 Rear cover of the 1982 Corvette brochure, linked from the Old Car Manual Project’s amazing brochures section. There is strong club support for the 1982 Corvette, as there is for all Corvettes. According to Hagerty’s valuation tools, all the money for a non-Collector Edition 1982 Corvette in #1 condition is $29,000, with a more normal number #3 condition car going for $13,900. 1982 Corvettes often show up in the Hemming’s Motor News classifieds—as I write this in September 2014, there’s a black car with a red leather interior with 39,000 miles available for $18,000. Make mine one of the relatively rare (and absolutely gorgeous) Silver Green Metallic cars, with the Silver Green interior.